book references. The benches are internationally acclaimed product, requires no other apparatus & comes in five set ups. 1. Klystron power supply solid state digital read out. 5. Frequency meter ( Direct Reading). 7. Slotted section with probe carriage. 12. VSWR meter, solid state. 13. 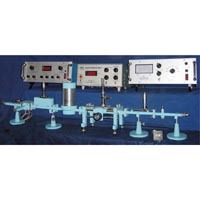 Waveguide stands : 4Nos. 15. BNC cable : 2 Nos. 15. BNC cable : 3 Nos. 7. Radiation pattern turn table. 12. VSWR meter solid state. 13. Board wall slot antenna. 14. Narrow wall slot antenna. 18. Coaxial to waveguide adopter : 2 Nos. 21. Waveguide stands : 4 Nos. 22. Waveguide bends : 2 Nos. 7. Slotted section with carrige. 13. Waveguide stands 4 Nos. 18. Set of Solid dielectrics of : Teflon , Nylon, Ebonite etc. 7. Fixed attenuator - 3db. 8. Fixed attenuator - 6db. 9. Fixed attenuator - 10db. 13. Slotted section with carriage. 14. VSWR meter solid state. 15. Waveguide stands 4 Nos. 21. MHD coupler - 3db. 22. MHD coupler - 10db. 23. MHD coupler - 20db. 25. E - plane tee. 26. H - plane tee.